Chapel Falls is another example of a great waterfall to be found in the Pictured Rocks National Lakeshore, one of my favorite places to visit. I’ve visited this area at least once every year, if not more than that. The trail heading to the falls is absolutely beautiful. I hiked it in July, and even then it was amazing. I can only imagine how pretty it must be in late May and early June when all of the wildflowers are in bloom. As you’re hiking along, you may hear a trickle along the way, which may be another waterfall hidden away from sight. 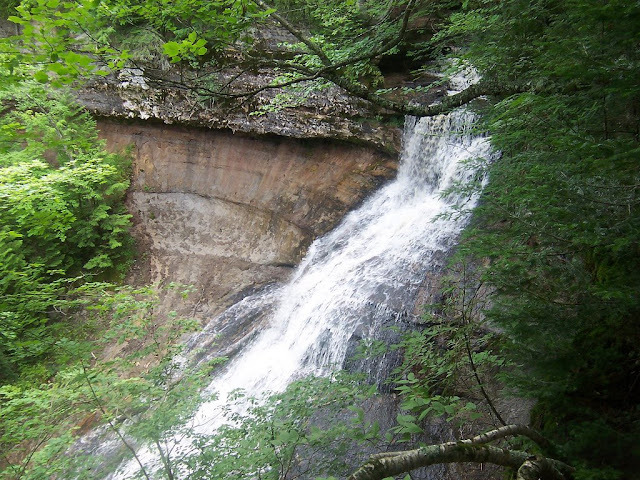 You’ll know when you reach Chapel Falls, as this waterfall is almost impossible to miss. I believe it is taller than it first appears. The only problem is that the viewpoints are somewhat prohibitive. There are two or three different viewpoints, two being before you cross the Chapel River, with the other being found after crossing the Chapel River. The one after crossing reveals that the falls are much more extensive than first would be expected. 1) From Munising, head east on H-58. Head about 16-17 miles on H-58 going east. 2) You’ll pass through a town called Melstrand. A mile or two after that, you’ll come upon a sign indicating the entrance to the Chapel Area of the Pictured Rocks. 3) You’ll turn left on that road, Chapel Rd. 4) You’ll head five or six miles down Chapel Rd. Stay on Chapel Road, which is not paved for much of the way. 5) Chapel Road will end at the parking area that leads to Mosquito Falls, Chapel Falls, Lower Chapel Falls, and Chapel Rock. 6) The trailhead furthest to the right leads to Chapel Falls, Lower Chapel Falls, and Chapel Beach. The first major stop on that trail is Chapel Falls.